Success of Eucharistic Adoration last December 18! On Sunday, December 18, the Triple V group is hosting a Eucharistic Adoration for 2 hours at St. Joseph Cathedral on 212 E. Broad St. 43215. The Eucharistic Adoration will happen from 2:45 PM to 4:45 PM. There will be litanies, prayers and scripture readings that will be presented during the adoration and silence! Confession will also be offered to those who would like to avail of it. This is the last Sunday before Christmas Day! What a wonderful way to prepare for Christ's coming into our lives - spending time with Jesus in the Eucharist and cleansing ourselves of our sinfulness! Come and bring your friends and family members to this wonderful opportunity! 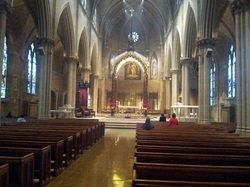 Last Sunday, December 18, we had over a dozen people who came to adore and worship Our Lord in the Blessed Sacrament. Fr. Shawn Corcoran presided over the Eucharistic Adoration and administered the Sacrament of Reconciliation to the penitents that lined up outside the Reconciliation Room during the period of silent adoration. Personally, I felt relieved after the Eucharistic Adoration, just having that silent adoration and communication with Jesus and to receive the Sacrament of Reconciliation as well! I know for a fact that almost 100% of those in attendance went to receive the Sacrament of Reconciliation. What a wonderful way to prepare our souls for Christ's coming into our hearts. Thank you for coming to the Eucharistic Adoration (you know who you are)! I know that Jesus is looking forward to making a home in your heart this Christmas!